In the debut appearance of Mirage’s one-issue “Micro-Series,” Raph is sparring with Michaelangelo when he loses his cool and goes after his good-natured brother with a wrench. 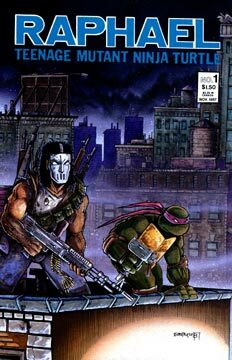 Leonardo breaks up the skirmish and sends Raph out to “cool off.” As he’s patrolling the rooftops, Raph wonders if he’s nuts and ponders his inability to control his temper. Casey quickly runs into some muggers and proceeds to stomp them. Raph sees the fight and feels that Casey is going overboard with his punishment and tries to stop the pounding before the crooks are murdered. Mr. Jones does not take kindly to Raph’s interference, and a fight breaks out between the two. Raph knocks Casey to the ground and Casey surrenders – only to “sucker punch” Raph with a golf club and escape. Raph is dazed and decides that this crazy vigilante has to be stopped, so he heads out in pursuit moments later. Casey spots two thieves stealing a car radio and quickly dispatches them. As Casey prepares to beat the crooks into mincemeat, Raph catches up with him. 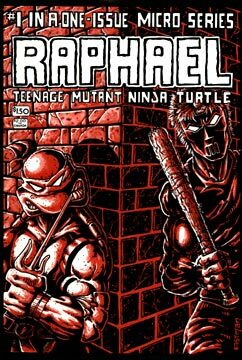 The two renew their battle and Raph knocks Casey down again, telling him that not all crimes are deserving of “capital punishment.” This has no effect on Jones and he lashes out at Raph and flees into the streets. Raphael has a moment of reservation – should he risk being seen by people or remain hidden and allow Casey to escape? Raph decides to pursue Jones and is spotted by some alarmed and confused drivers. Casey hides in a park and attacks Raphael when he appears. The battle is fierce and Raph once again gets the better of Jones, who finally surrenders for real. The two have a quick discussion. Raph tells Casey that killing people for stealing tape decks is crazy. The boys continue the argument until they hear some cries for help, and then they head off to battle the criminals in a tentative alliance.